At TradingBlock, we like to refer to ourselves and to our clients as "blockheads". Now that term probably conjures up images of Charlie Brown or some dolt from grade school. But for those of us who have made a bad investment or trade at one time or another (and that would be all of us), we've all worn the "blockhead" label. So, to us and our clients, "blockheads" is an endearing, therapeutic and forehead-slapping description of those among us who have experienced the spanking of a bad trade only to realize the value of planning and risk management. And that describes our mission at TradingBlock. Our goal is not to see you rack up that one bigger winner, but instead to see and help you achieve investing and trading success over the long-term. That's why we're driven to provide you with more intuitive investment tools that help you plan and understand risk, with pro-active support services and financial education resources designed to help you make better investment decisions for you, your family and your future. As we grow our business, we're committing resources to promote investing literacy that we hope will result in a meaningful improvement in how you invest and trade. We're also making a more personal commitment to helping you achieve your financial goals that results in greater value for you and your portfolio. Online investing and trading shouldn't be nerve-wracking, and you shouldn't have to go it alone. It's challenging, but it should allow you to gain control of your financial future while enjoying the other aspects of life...like the living part. To execute our mission, we've assembled a highly qualified management team with extensive knowledge and experience in creating innovative online financial solutions for investors and traders. Jere is the CEO and president of TradingBlock, which was founded on the brokerage firm he started in 1997 - AOS, Inc. Prior to AOS, Jere was a founding member of Caris & Co., a FINRA-registered broker/dealer where he managed day-to-day operations. Before Caris, he managed options trading operations for Alaron Trading. Jere began his industry career as a floor trader on the CBOE in 1982 and subsequently worked for a number of firms including Chicago Corp., Mabon Nugent, and GRF before becoming an independent market-marker. Jere holds FINRA licenses Series 7, 3, 4, 24, 55 and 63. He graduated with a B.S. in Accounting/Finance from Marquette University. Don is a financial services professional with over 15 years of industry experience, having gained broad exposure to equities, options, mutual funds and futures products. He oversees firm operations and coordinates on-boarding and support efforts for TradingBlock and MoneyBlock. Don began his financial career at Janus funds in Denver, Colorado, before moving to Chicago where he helped to establish the Elite Services division of WebStreet Securities. In 2001 Don moved to Terra Nova Financial, where as Director of Client Services he oversaw support and trading operations, and was instrumental in the firm's conversion to self-clearing and ultimate acquisition by RushTrade Securities. In 2009 he joined MF Global as VP of Electronic Trading, where he helped streamline and modernize global trading operations in futures and derivatives, before joining the TradingBlock team in 2012. Don holds FINRA licenses 4, 7, 24, and 63, and is Designated Registered Insurance Principal for AOS, Inc. dba TradingBlock and MoneyBlock. He graduated with a B.S. in Industrial Psychology from the University of Illinois (Urbana-Champaign). Phil has over 20 years in the securities industry with the majority of that time in Compliance and Supervisory roles. Phil started his career on the floors of the CBOT, CME and CBOE in 1991 and ultimately moved into Compliance and Management. Phil has spent the majority of his career as a Chief Compliance Officer. Some of that time he also served as a Branch Manager, SROP and CROP. Phil was the Chief Compliance Officer/Branch Manager, at Man Financial (formerly E D & F Man International Inc.) from 1996 to 2003. In 2003 Phil moved to Allstate Financial Services where he was the Chief Compliance Officer for their retail broker-dealer, which had over 10,000 registered representatives throughout the United States. He left Allstate in 2006 to take over as Chief Compliance Officer for brokersXpress, LLC. and eventually optionsXpress, Inc. until leaving in 2012 to join the TradingBlock team. Phil has the following securities registrations: Series 4, 7, 8, 14, 24, 27, 55, and 63. Tom is a financial services industry veteran specializing in new, high-growth ventures, and reorganizations. He oversees marketing and business development for TradingBlock and its affiliated companies. 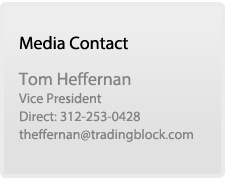 Before joining TradingBlock, Tom was an independent marketing consultant serving several financial industry clients including the CBOE Options Institute, technology and investor education firms, financial advisors and hedge funds. Prior to then, Tom was the Director of Marketing for OptionVue Systems International, a developer of high-end options analysis software, where he oversaw the company's marketing, sales and distribution network. Tom has also held executive marketing positions with several start-up and small-cap technical and manufacturing firms. Tom holds FINRA licenses Series 27 and 63. He graduated from the University of Iowa with a B.A. in English. Gary's broad range of experience provides TradingBlock with a solid foundation in trading, operations, and compliance. Prior to joining the TradingBlock team Gary spent 9 years as the Executive Vice President and Chief Operating Officer for brokersXpress, LLC. (2003-2012). As brokersXpress' first full time employee Gary helped build the firm from a small boutique shop with a dozen independent reps to a full service firm with over 300 reps and advisors. Gary started his career in 1985 with Pacific Brokerage Services and played an integral part in establishing the company as an online brokerage pioneer and leader in online trading. As a member of the senior management team, Gary played a critical role in Pacific's acquisition by Mellon Bank and integration into Mellon's Dreyfus unit. Following the acquisition, he was appointed Senior Registered Options Principal of Dreyfus Brokerage Services in 1998, and was later named Trading Manager, overseeing its national trading operation. Gary has served on several industry panels and committees including FINRA's Western Region Committee representing District 2 and FINRAs Nominating Committee. Gary has the following registrations: Series 3, 4, 7, 8, 14, 24, and 63. June 15, 2011. Biju sits down with Tom Sosnoff. 4-stars for "Platform Usability" and favorable comments regarding the site's "cool tools". November 2, 2010. TradingBlock CEO Biju Kulathakal and VP of Product Development Steve Hoffman visited with Mark Longo to discuss TradingBlock's new features and objectives. November 10, 2015 – Independent broker-dealer AOS, Inc., which does business as MoneyBlock and TradingBlock, and financial technology company Tradespoon have partnered to launch Quantly, a new portfolio construction and rebalancing platform for independent investment advisors and registered representatives. Available directly from the MoneyBlock brokerage platform, the technology uses quantitative algorithms to construct and rebalance stock and ETF portfolios. July 8, 2015 – Following a strong recruitment performance for the first half of 2015, AOS, Inc, which does business as TradingBlock and MoneyBlock, an independent broker-dealer supporting self-directed investors and traders, independent registered representatives and registered investment advisors and their clients, reports continued growth entering the 3rd quarter recruiting season which begins in earnest in mid-September. June 8, 2015 – Trading Block Holdings, Inc., a financial technology and services holding company and parent company of AOS, Inc., which does business as TradingBlock and MoneyBlock, leading online brokerage businesses serving investment professionals and their clients, self-directed investors and traders, announced the appointment of Paul Finnegan as Chief Executive Officer. January 28, 2014. OTC Markets Group Inc. (OTCQX: OTCM) today announced it is providing its real-time Level 1 quotes on OTCQX®, OTCQB® and OTC Pink® securities to TradingBlock, an online brokerage firm for self-directed stock investors. TradingBlock customers can now access real-time best bid/best offer and size data on OTCQX, OTCQB and OTC Pink securities, as well as real-time trade data from negotiated transactions and information on individual securities. July 30, 2013. Online broker TradingBlock today announced new portfolio margining capabilities for TradingBlock Pro, its suite of active trader products and services. Portfolio margin can help active traders better manage their overall portfolio by giving them a single, comprehensive picture of risk and by freeing up capital for additional investment. March 15, 2012. To help investors protect gains in their equity portfolio against market volatility, online broker TradingBlock (Chicago, IL) introduces Portfolio Hedger, a query-based tool that lets investors quickly create and rank protection strategies for nearly any stock or ETF in their portfolio. March 22, 2011. With their new Instant Login feature, online broker TradingBlock (Chicago, IL) now offers investors free, no-obligation access to TradingBlock.com. The site is designed to help more investors understand their strategy alternatives before they place their money at risk. TradingBlock recently earned four stars for "Usability" in Barron’s "2011 Online Broker review"* of the top online brokerages. March 8, 2011. For investors that have a bullish, bearish or neutral sentiment on an individual stock or ETF, TradeBuilder from online broker TradingBlock (Chicago, IL) helps them identify strategies that may offer a better return and lower risk than long or short stock.